Right after Christmas this year I started getting a really sore throat and everything went downhill from there. It started with a sore throat and it quickly moved in to my lungs. I was coughing and hacking non stop annoying everyone around me. Around mid January I finally went to the doctor and was diagnosed with bronchitis. I was given antibiotics and an inhaler and sent home to rest. By the end of January I wasn’t feeling any better and had to return to the doctor. Again they told me I had bronchitis and was given a heavier dose of antibiotics and was told to continue the inhaler. By mid February I found myself in urgent care on a Saturday because my primary doctor was afraid I had pneumonia. I had xrays and a full examine and was told I did not have pneumonia but I still had bronchitis and to top it off I had asthma. Asthma?! I was given another round of antibiotics and some strong cough medicine and sent home again. This time, after two months, I started feeling better. I slowly felt myself getting my life back and I was so excited. At the beginning of March I had a half marathon schedule which I downgraded to a 5k but was still determined that I was going to run. I had actually run a 5k in January while I had the bronchitis and that was horrible (I would not advise anyone to do that)! My 5k in March was rough but I was still feeling better than the last couple of months but I started wheezing about a mile in to the race. I could still run but I could feel and hear the wheezing and it was definitely not something I had experienced before. Shortly after the race I went back to my doctor for my final check-up and was told that because of the bronchitis and the scarring in my lungs I now have exercise induced asthma. I figured that this would be short term and I would be back to myself in no time and be asthma free. 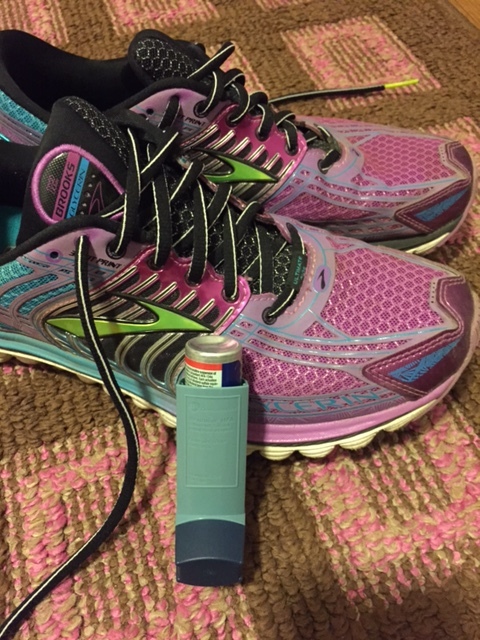 I used my inhaler before longer runs and was feeling better. Then summer came. The heat and humidity seem to be my asthma triggers. I was told that it was cold weather that usually wreaked havoc with asthma! I would warm up and within minutes of running I could feel the wheezing starting again. In all honesty I keep forgetting my inhaler and have had trouble getting in to the routine of using it regularly but I can definitely feel the difference when I use it and when I don’t. The weirdest thing is going through 34 years of my life without asthma and suddenly having it. If I have had to deal with an inhaler since I was little maybe it would be easier to deal with but I have found it to be very discouraging. At a recent boot camp we were running steps and I had to stop because I couldn’t breathe. I knew I could still physically run the stairs but my lungs were failing me and I had to stop and step to the side to catch my breath. This was the first truly terrifying moment I had with my asthma. I have been proud of myself from not letting this be my excuse for not continuing to run and exercise. I just need to work on managing it better. If you live with asthma do you have any suggestions on how to cope with it?